Lin Sanzhi (1898–1989) was one of the most important Chinese calligraphers of the 20th century. The book is a detailed record of Lin's life experiences over more than 90 years. Lin Sanzhi (1898–1989) was one of the most important Chinese calligraphers of the 20th century. The book is a detailed record of Lin's life experiences over more than 90 years, charting his studies, travels and compositions. The book is informative and collectible as it provides a comprehensive understanding of Lin's artistic talents and life as well as contemporary Chinese art history. 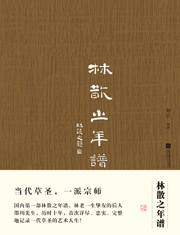 • China's first comprehensive, detailed and accurate record of the artistic life of Lin Sanzhi, who was honored in the 1980s as a "Contemporary Saint of Cursive Calligraphy". • Winner of the annual "Good Book in China" in 2016 by China Central Television.